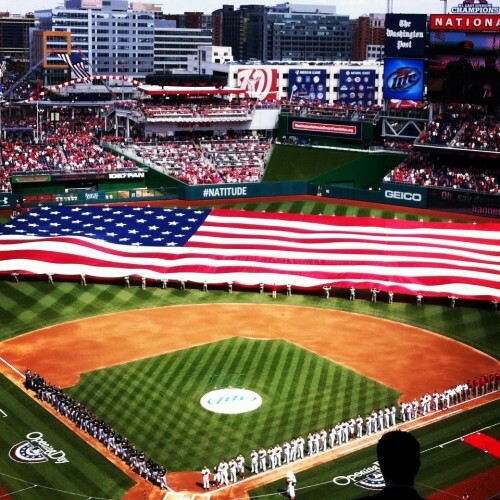 The success of Washington’s 2012 season trickled over to Opening Day 2013 as young guns Stephen Strasburg and Bryce Harper led the Nationals to their first win of the year, a 2-0 victory over the Miami Marlins. Strasburg was efficient through seven innings. He threw 80 pitches, 52 for strikes, and gave up three hits while striking out three. After giving up a leadoff single to Marlins left fielder Juan Pierre in the first, Strasburg retired 19 consecutive batters before giving up his only extra-base hit (2B) of the day to Marlins third baseman Giancarlo Stanton in the seventh inning. Stanton was picked off on the base path shortly after during an impressively executed 7-2-3-4-2 double play – a play which is certain to be shown on Sports Center later tonight. Stanton reached third base off a one-out single hit by Marlins third baseman Placido Polanco in the seventh. But despite having the opportunity to score a run for Miami and tie up the game at one run a piece, Stanton was eventually called out at the plate. Marlins catcher Rob Brantly lined the ball to Harper in left field, initiating the double play, leaving the Nats in the lead. Harper’s work in left field wasn’t the only highlight of his afternoon. In his first Opening Day wearing a Major League uniform, Harper hit not one but two homeruns to the right-center field seats off Marlins right-handed starter Ricky Nolasco. Both were hit in his first two at-bats and neither of the balls hit were easily crushable. His first homerun came off a 1-0 curveball in the first and the second was off a 3-2 slider in the fourth. In contrast, third baseman Ryan Zimmerman had a rockier day at the plate going 0-for-3 with three strikeouts, two looking. Zimmerman did have success on the diamond with his glove, though. His first “web gem” of the season came in the first inning and kept Pierre from scoring off what could have been a base hit from Polanco. Off-season acquisition and new pitcher Rafael Soriano also made his home debut in today’s game. He entered the game in the ninth after a shut-out eighth inning pitched by right-hander Tyler Clippard. Soriano faced the minimum to get his first save of the season. Fans turned out for the day’s pageantry and festivities in hordes, setting the highest regular-season attendance record at Nationals Park since it opened in 2008 with a crowd of 45,274. That’s just about 700 shy of the highest attended game in the park’s history which was Game 5 of the 2012 National League Division Series this past October.